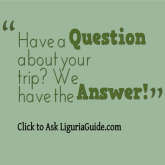 These days, it's not difficult to get to Liguria which is well connected with the rest of Italy and Europe by railway, motorway, international airport and ferry ports. The transport network in the region is very efficient with good railway and motorway links to the main cities making exploring the area very easy and convenient. However, most of our holiday accommodations are in country locations, so a car hire is essential to get to and from the accommodation and to explore this enchanting region. On the other hand, if you want to avoid the car queues especially during the summer months and weekends, we recommend you take advantage of the good train and boat links. The regional trains make stops in all local areas and we especially recommend them if visiting the National Park of Cinque Terre. 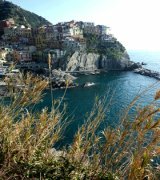 It is possible to approach the villages of Cinque Terre by car, but there is no use for a car once you're there. Cinque Terre historical centres are closed to car traffic. We hope you find the following information useful, if you require any more detailed info, please get in touch . We'll do our best to find out the info for you.